So on June 28th (Thursday) I had my weekly appt with my OB/GYN, and when I went in I was super chill, I gave my urine sample and went to wait in the room with my hubby (this was the first appt since the ultrasound at 20 weeks he was able to come to, so first time in 19 weeks he was hearing our baby’s heartbeat!). The nurse (Diana) came in and we did the usual, she weighed me while checking protein content and then took my blood pressure. For the first time ever, there was protein in my urine and after 4 different times taking my pressure (with lying on my side in between) she could not get one in a normal range. Thus, the conversations of induction began; my doc and Diana knew my position on this- I did not want to be induced. Instead, she gave me a sterile urine cup, and asked me to take a clean sample the following morning just to be cautious and then bring it in. ***Side note- my hubby sells cars and due to his job and some killer incentives, we were ending a lease on our SUV early, and the new car would be mine, and it was the car that we were installing the car seat in…I needed to co-sign, and it was supposed to happen Friday…Naturally I am thinking, well I can’t be induced, we need to get the car the baby is going home in! Luckily, we got that done on Thursday night! I woke up Friday and finished making some granola bars, sterilized my bottles and pacifiers, and then I called my mom- she was going to go with me to my OB because my hubby had to work (Thursday was his day off, Friday wasn’t, and we wanted to proceed as if everything was normal). On the off chance they wanted to induce me upon seeing my protein and pressure, I decided to run some errands first! We went to Target to get some things I had shipped to store, and then flip flops from Old Navy, and then the doc. I walked in and grabbed a tootsie pop off the receptionist desk and was ready to go. My protein was lower…but still there. Pressure was still high after multiple readings. Diana asked to sweep my membranes to try and get things moving that way- I gave my consent. She also informed me I was roughly 2 cm dilated. Lo and behold, midway through her starting my bag of waters broke! She and the doctor looked at me and were like- “Did your water just break?” Sure enough- it had! Within 15 min I had my first wave (Hypnobabies word for contraction). They said if things moved on the slower side they wanted me to admit myself to the hospital at midnight (12 hours after my water had broken). I said that was fine, and told myself to just roll with it, this is how my baby was going to do things! I was eating my tootsie pop this whole time…something my mother still finds hilarious. After I had lunch with my mom and got settled at home, I let my hubby know what was going on, and he decided to come home. I also pre-registered with the hospital, the less we had to worry about later on, the better! I then asked around on the group and figured it was a good time to start listening to my birthing day tracks, so I listened to the “Your Birthing Time Begins” track and then “Easy First Stage.” I listened to that track on repeat for a while before alternating between it and the Deepening track, which has always been one of my favorites. Fast forward to about 9:30 pm and my waves were lasting about 1-1.5 minutes and were about 7-9 minutes apart (we used the Hypnobabies app to time, so helpful!). I had been alternating between listening to my tracks and hopping in the shower every two hours as per my OB- the shower definitely helped-I realized that when I was warm, my waves were more frequent, which I found interesting. My body has always been more sensitive to temperature. The entire time this was all happening, Diana would periodically check in with me to see how I was doing. At around 10:45 she called me to touch base; I told her not much had changed, should I still go in at midnight? She told me that a nurse was in L&D who was super chill, and would jive well with me (my doc and Diana knew I was using Hypnobabies and what my birth plan entailed)- this nurse would get the next admission, so if I just went now, my odds would be pretty good, so in about 20 min, my hubby and I were out the door! We got to the hospital and I was checked in and brought upstairs where they got me all set up. I did not fight them having me change into a hospital gown, but I was definitely bummed when they made me take off my fleece pants 🙁 Plus, it made me chilly, which slowed my waves down (up until that point they had been picking up speed). When I was checked at the hospital (12 am) I was 3 or 4 cm at that point. The nurse was exactly as I had been told- super chill, her name was Natalie. I handed her my birth plan and explained how I would be using Self-Hypnosis in my birthing time. She got right on board and not once did she ask me about pain meds. Come 4 am I had only dilated about 1 cm more, so they began Pitocin. I was not crazy about the idea but understood the concern since I had shown signs of pre-eclampsia. The Pitocin intensified my waves significantly- I breathed through them and pictured my bright orange hypno-anesthesia, but I was not getting much rest in between them. 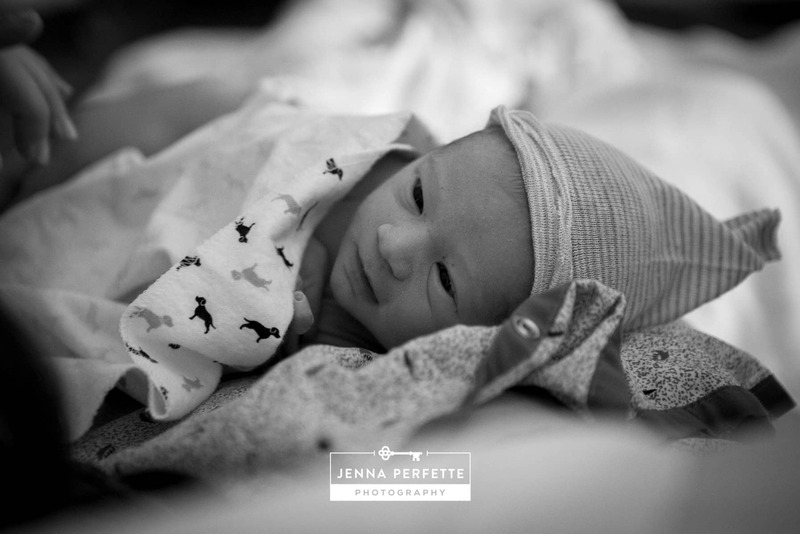 I became concerned that I would be too tired to birth my son when the time came. At 9 am I was checked again- 6 cm. 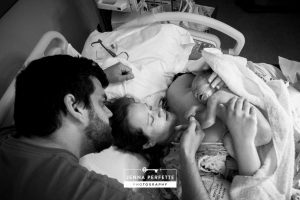 My greatest worry was that due to the Pitocin I would end up with uterine fatigue if my birthing time lasted too long; I did not want a stalled birthing or the possibility of a c-section. As a result, I opted for an epidural. It was not my first choice, but I do not regret it. I could still feel the pressure of my waves, and I could feel my son’s position, once I was fully dilated, he would be ready to go! I was able to rest, and at 1:42, William was born. I did not listen to the Pushing Baby Out track (Hypnobabies special pushing track)…We actually had the Disney movie Inside Out playing on the tv (super appropriate because we are huge Disney fans). 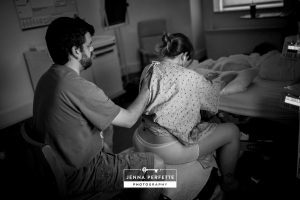 I did have to have coached pushing, but there were definitely times where I could feel my body working on its own, doing what it does best, even with the epidural! 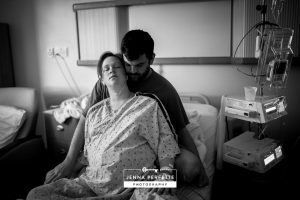 Despite my birthing time (Hypnobabies word for labor) not going quite as I envisioned, I still had amazing support from my hubby and my best friend (a photographer who photographed the birth). Hypnobabies got me through 18 hours and 6 cm of my birthing time. I think I needed a little more discipline on using my mental light switch (Hypnobabies tool for entering hypnosis), but there is no question that Hypnobabies helped! I fully intend to use it for my next birth; my hope is that the next one can be closer to what I hoped for. The important part is that William is happy and healthy!